"I found the Airstream in the high desert of Anza, California, and thought it was a pure TLC job. Wishful thinking!" says interior designer Caroline Brandes, who also rents renovated Airstreams on her property in Big Sur through Big Sur Getaway. "Even though the interior looked decent, once back home in Big Sur I had discovered water leaks, extensive floor rot under the linoleum tiles, and even frame damage." 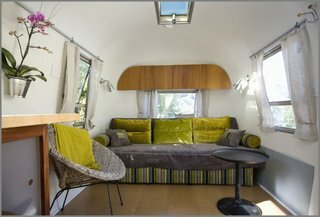 She hired Area 63 Productions, a professional Airstream renovation company, to help. For the interiors, she sought a clean and airy look. "Most of the trailers I had seen so far were restored close to the 'vintage' idea, and to my taste most of them feel too dark, too cluttered and too traditional," she says. "I wanted the trailer to feel airy, calm and open, nearly a bit Zen-like." Here's a glimpse into the renovation, start to finish. This is what the Airstream looked like upon purchase. Unfortunately upon closer inspection it turned out to be mouse infested. That meant the whole interior had to be torn out. Area 63 productions removed the entire interior. Over time, water leaks had damaged the 45-year-old rockwool insulation to a point where it was so clumped together that it hardly insulated anymore. "Within the shortest time of sun exposure, the trailer became boiling hot—and stinky!—inside," says Brandes. The wooden floor was rotten from water damage and needed replacement. The restorers used the old rotten floor as a template for the new one. Two layers of fresh Prodex insulation were put in. Then they put the inner skins back in, painted the walls and ceiling, and installed new cork flooring. Here's the new layout, with furniture being built in. The original bathtub and sink received a fresh coat of bright white paint. Brandes and Area 63 Productions designed this custom built-in platform sofa bed for the back of the Airstream. The lower platform pulls out and swings up on special hinges to turn the sofa into a queen size bed. Here's the finished sofa bed. The sofa is upholstered in Designers Guild fabric. The curtains are from Ikea. The chair is from Cost Plus. And the wall cupboard above incorporates some of the trailer's original mahogany wood. Here's the custom-built galley kitchen and bar. They installed new mahogany laminate to match the original furniture. Brandes designed the ceiling lights, and Area 63 fabricated and installed them. The countertop is from Ikea, the camping sink is by Thetford, and the stove is by Ramblewood. Here's the updated bathroom, made fresh with a coat of white paint. A closer look at the Designer's Guild fabrics. "I work exclusively with those fabrics, no other label creates colors and patterns like DG," notes Brandes. An exterior view of the finished trailer, installed on site in Big Sur. It's available for nightly rentals. Another perspective, showing the mountain views.